According to statistics provided by the Institute of Real Estate Management, annual maintenance costs are higher than administrative expenses and almost as high as operating expenses, so having a detailed maintenance process is essential to well-executed property management. 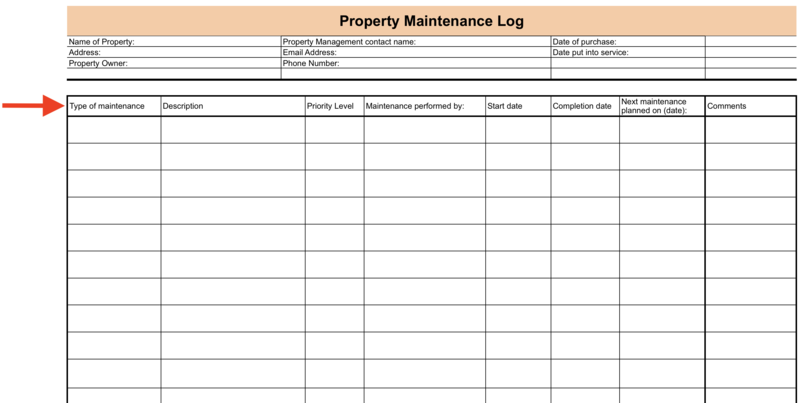 A well-organized maintenance log is a must-have for every maintenance supervisor and building owner as it provides a concise breakdown of maintenance needs identified through inspections and a way of tracking all the work being done on the property. 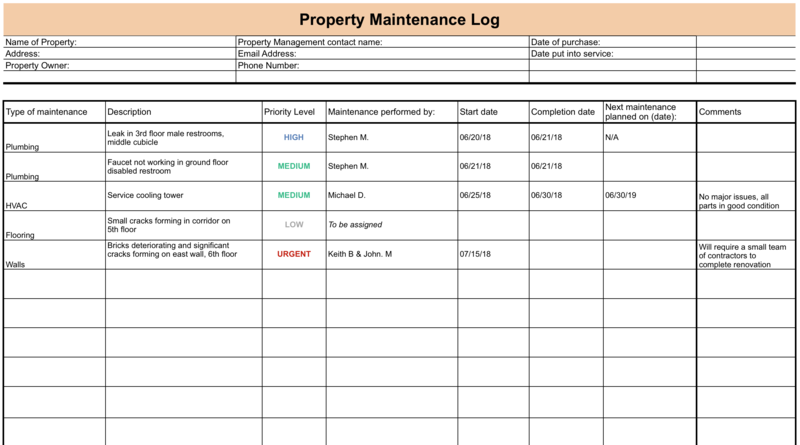 This checklist will help you set up a log spreadsheet by outlining exactly what needs to be included and how it should be tracked throughout the inspection and maintenance process. The first step in building your maintenance log is outlining the basic framework of your spreadsheet. What are the labels that are going to organize all of the important information? It is up to you to decide how complicated you want your log to be, but try to keep it as simple as possible. The log will be referred to by various members of the maintenance team throughout its use and should be organized in a way to avoid any room for confusion. The details filled in below should go across the top of the spreadsheet. For repeatable tasks, if you would like your log to last longer than one round of maintenance work, you can add extra date columns and label them Date 1, Date 2, Date 3 etc. Remember that there is plenty of room for customization to suit your unique maintenance processes. While working on the next few tasks, think about how you may need to adjust the template to better serve your needs. Once you've got a basic framework and feel happy about the log template, you can begin collecting all of the information that will populate the spreadsheet. What are all of the various areas of maintenance that apply to the property? Check out the Apartment Building Maintenance Checklist for an overview of important areas of maintenance you should consider. Now it's time to get into the details. After a thorough inspection of the building has been completed, gather all of the feedback and begin listing which specific things require maintenance work. Items in this list will be stated in the description section of the spreadsheet. Description: Lounge on the 2nd floor, paint is flaking on the north wall, bricks have begun deteriorating. Each item you list must fall into one of the categories listed in the previous task. This way everything in the log will be well-organized and nothing will be neglected. Make sure you don't leave anything out. Even the items that seem trivial or not urgent should be stated as they can be prioritized later on. 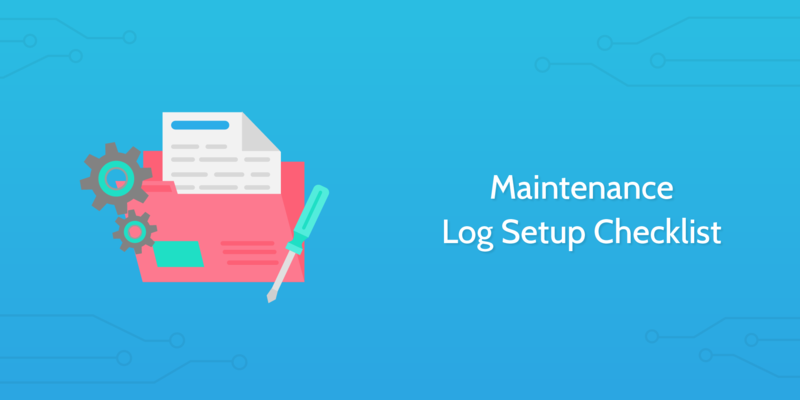 For the log to be a useful resource, it needs to be a centralized source of information that provides an overview of all maintenance activities. List items and/or attach a document below. Once all required maintenance work has been documented, divide the list into short-term and long-term activities. Tasks like changing light bulbs, reupholstering furniture and sweeping the roof will obviously not take very long, whereas repairing a serious drainage issue that has affected a number of apartments or an electrical issue with the HVAC system will take longer. This is the first step to prioritizing maintenance tasks. The next step is to insert a priority label next to the description of each task. Below is a very basic log containing a number of maintenance activities to give you an idea of how to fill in the various fields. When building your spreadsheet, you'll want to improve organization by adding filters. Once you feel happy with the initial setup of the log, share the document with the appropriate team members. Having established open communication channels with your maintenance team and outlining responsibilities, monitor how the log is used and how often it is being updated. Request feedback from the team after a couple of weeks to evaluate its effectiveness. In addition to tracking maintenance work through your log, it may be a good idea to integrate a modern, cloud-based solution. A couple of great options for property maintenance software are Propertyware and Appfolio. You can also check out the highest-rated building maintenance software tools on Capterra.